“Migration has been a part of history since the beginning of mankind.” Wars, famine, poverty, political or religious persecution, natural disasters, armed conflicts and many other threats to human security urge people to move, often forcing them to share the same routes and means. Why is this journey unsafe? These people are travelling in unseaworthy boats to find safer and improved living conditions, although many of these people, due to the sometimes long journeys, poor weather conditions, and the bad infrastructure of the boats, are losing their lives at sea. Considering that most migrants had chosen to cross the borders by land, international and regional actors intensified their land operations, leading to a reciprocal increase in the percentage of migration by sea. Unsafe mixed migration differs from migration in general because in the case of mixed migration there is variety of reasons why people are moving away although they share the same routes, modes of travel and vessels. It is considered unsafe due to the fact that people travel through extremely dangerous passages and in extremely precarious situations. Considering these factors, unsafe mixed migration is a multidimensional problem that requires multidimensional solutions. It should not be ignored that this issue has a social, economic, political and geopolitical nature. In order to bring about viable solutions, a collaborative effort that incorporates all of the stakeholders contributing effectively in the management of this challenge is necessary. Migrants crowd the deck of their wooden boat off the coast of Libya. Photograph: Reuters. It should be pointed out that all ships carrying migrants are subject to the rescue at sea obligations by the Safety of Life at Sea (SOLAS) and Search and Rescue (SAR) Conventions, and ship masters and governments are committed to transfer endangered migrants to a safe place. 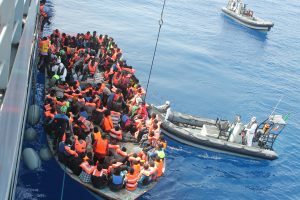 Governments, regional and international organizations, including the European Union, African Union, International Maritime Organization, and International Organization for Migration, as well as the shipping community, should collaborate on measures to prevent the future loss of lives of migrants at sea. 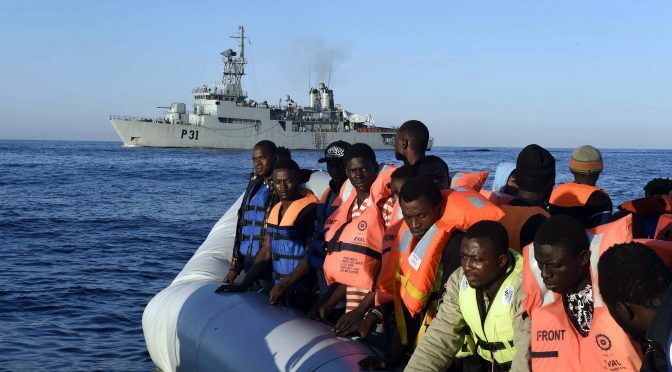 This article will analyze the phenomenon of unsafe mixed migration in the Mediterranean and the efforts made by international and regional actors. The International Maritime Organization (IMO) has actively participated in the hotly debated topic of unsafe mixed migration and the maritime issues that have arisen from it, such as safety of life at sea and search and rescue. IMO highlighted the importance of close cooperation among the regional and international stakeholders in the regional migrant problem. IMO is actively addressing these mixed migrant issues within its own committees as well as in joint meetings with UN partners and other relevant international organizations by updating and developing guidance for shipmasters and governments in order to efficiently manage unsafe mixed migration. As a UN agency with responsibility for safety at sea and the legal framework surrounding search and rescue, IMO amended SOLAS and SAR Conventions and their associated guidelines after the Tampa affair in August 2001. These changes can play a crucial role in promoting effective cooperation between United Nations agencies, international organizations, nongovernmental organizations, governments, and the shipping industry. Another of IMO’s significant contributions to resolving the issue of unsafe mixed migration is its guidance regarding rescue at sea situations. The guidance includes legal provisions on practical procedures as well as measures to ensure the prompt disembarkation of rescued people and the respect of their specific needs. This guidance, created in cooperation with the International Chamber of Shipping (ICS) and the Office of the High Commissioner for Refugees (UNHCR), has appealed to ship owners, governments, insurance companies and other interested parties involved in rescue at sea situations. Recently, in November 2015, the International Chamber of Shipping submitted “Measures to protect the safety of persons rescued at sea,” which provides guidance for large-scale rescue operations at sea, ensuring the safety and security of seafarers and rescued persons. Also, the document provides information on the second edition of the Guidance and supersedes the first edition of the Industry Guidance. The second edition of the Industry Guidance is supported by the European Community Shipowners’ Associations, Asia Shipowners’ Forum, International Transport Workers’ Federation, Cruise Lines International Association, International Association of Dry Cargo Owners, International Association of Independent Tanker Owners, International Parcel Tankers Association and the International Ship Managers’ Association. Because the “shipping community is not designed for rescuing hundred of thousands of people drifting on hundreds of small, unseaworthy boats left in shipping lanes,” this guidance is “intended to help shipping companies identify and address particular issues that their ships may face when required to conduct a large scale rescue.” What should be emphasized is that this guidance is purely advisory and not mandatory. Regarding the EU perspective, in the meeting of Foreign Affairs Ministers in Luxembourg in 2015, the High Representative of the Union for Foreign Affairs and Security Policy, Mrs. Federica Mogherini, highlighted that the EU’s external action should be coherent, substantial, and consistent. The EU has legal and moral duties in this crisis, and this situation is not going to affect one or another state but all of the EU member states. Also, she mentioned that this is not a regional crisis but a global crisis and stated that the EU should strengthen the cooperation of member states without any kind of “blame game” among them. Mrs. Mogherini stated that the EU should enhance cooperation in five different elements: firstly providing protection to those people who need international protection; ensuring the management of borders; fighting against smugglers’ and traffickers’ networks; strengthening partnerships with third countries; and last but not least, taking efforts to work on root causes. This final objective maybe a long-term effort, but it is crucial to establish the rule of law and stability in the countries of origin. On 18 May 2015 the EU decided to create a naval force to prevent human smuggling in the Mediterranean. This naval power is a part of the broader approach to avoid losing human lives in the Mediterranean Sea. The joint meeting of foreign and defense ministers discussed the Common Defence and Security Policy and tried to make the CSDP stronger and more effective in view of the security challenges in Europe, specifically crises such as Syria and Ukraine. The EU Naval Force-Mediterranean (EUNAVFOR MED) aims to put an end to the business model of smugglers and traffickers. The operation is based in Rome, led by Italian Rear Admiral Enrico Credendino, and operates in the South and Central Mediterranean and in cooperation with Libyan authorities. The operation will surveil and evaluate the networks of smugglers in the first phase, followed by the search and seizure of traffickers’ profit, and always within the context of international law. Mrs. Mogherini said the decision to establish a naval force was part of a comprehensive approach to solve the migration crisis in the Mediterranean. She also stressed that the EU will work with African and Arab countries and partners to help address the causal factors of the migration crisis in the Mediterranean region. In a joint statement from IMO Secretary-General Koji Sekimizu and IOM Director-General William L. Swing on enhanced cooperation and collaboration between the two organizations, the leaders confirmed their close cooperation in order to manage unsafe mixed migration and reemphasized the cooperation between the two organizations originally agreed to in 1974. The IMO Secretary General and IOM Director General recognized that this situation consists of a humanitarian crisis and requires global action. The two organizations agreed upon seven points including an interagency platform for information sharing, collaboration with other interested agencies, promotion of the provisions of SOLAS, SAR and Facilitation of International Maritime Traffic (FAL) Conventions and international migration law, support of the relevant technical cooperation programs of each organization, the setup of technical or advisory bodies, facilitation of discussions to find solutions to unsafe migration by sea. Additionally, they urged the international community to take robust measures against human smugglers who operate without fear or remorse and who deliberately and knowingly endanger the lives of thousands of migrants at sea. 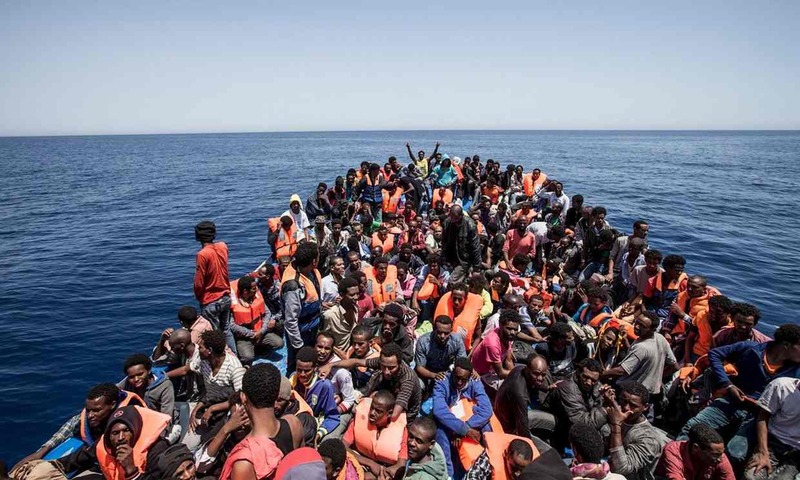 Regarding the EU efforts, IOM expressed its satisfaction regarding the organization’s recommendations which became part of the proposals made by the European Commission to address the crisis of migration in the Mediterranean. These recommendations concern the equal responsibility of all EU member states in the issue of asylum seekers. In addition, the reforms of the European asylum system as described in the plan of the Commission were welcomed by the Special Representative of the UN Secretary-General on International Migration and Development, Mr. Peter Sutherland. Mr. Sutherland also stated in regard to the plan that he believes the resettlement goal of 20,000 immigrants will be increased over time and that the EU will continue to expand safe routes providing assistance to asylum seekers and migrants. According to Director-General of IOM William Lacy Swing, the proposed changes as expressed by the newly established “European Agenda for Migration” reflect the serious and constructive approach to a challenge that IOM expects to continue. These initiatives are promising for maintaining safe, legal migration routes and improving access to international protection. In addition, the proposed tripling of the Triton budget will expand the area of operations beyond the current limit of 30 miles and will expand its activities into more dangerous migrant and smuggling routes to help save lives of migrants in high seas. FRONTEX Joint Operation Triton concerns the management of migration in the Central Mediterranean. LÉ Eithne rescuing migrants as part of Operation Triton in June 2015. The IOM has expressed its concerns regarding the military operations conducted in the region, arguing that they can further risk the lives of migrants. This does not mean that the IOM does not recognize the necessity of strong proof of the EU’s determination and its willingness to proceed to substantive actions to eliminate this serious challenge. The IOM states it is ready to contribute to the development of viable migration policies that will improve the legal “channels” for people seeking work and asylum. IOM believes that sound labor migration policy is the key to a more competitive Europe. Another aspect highlighted by the IOM is cooperation with migrants before they reach the Mediterranean and the support of countries of transit which bear the brunt of those people displaced by conflict and human rights violations. Niger, for example, is a key transit point for migrants heading to Europe. The Commission plan aims for IOM and UNHCR to create “a pilot multi-purpose centre” in the country, which will provide information on the dangers ahead, protection from exploitation and identification of those in need of resettlement, temporary protection, and other options. In October 2014 the African Union launched the AU-HOA Initiative known as the Khartoum Process. The AU Regional Ministerial Conference in collaboration with the Government of the Sudan, the United Nations High Commissioner for Refugees (UNHCR), the IOM, as well as ministers from more than 15 source, transit, and destination countries of migration took part in the initiative’s launch in Khartoum, Sudan. The AU-HOA Regional Ministerial Conference calls for a stronger collaborative approach to tackle human trafficking and smuggling in the Horn of Africa. In his opening remarks, the African Union Commission (AUC) Director of Social Affairs, Dr. Olawale Maiyegun, affirmed on the AU’s continued commitment towards facing the challenges of trafficking and helping its member states address this issue. Dr. Maiyegun highlighted the framework that the African Union adopted and initiated in this regard, including the Ouagadougou Action Plan, the Migration Policy Framework for Africa in 2006, and the African Union Commission Initiative against trafficking (AU.COMMIT) in 2009. The Second African Union Regional Conference on Human Trafficking and Smuggling in the Horn of Africa was held in Sharm El-Sheikh on 13 and 14 September 2015, and it aimed to prepare the ground for the global summit of migration which took place in Valetta on 11 and 12 November 2015. The discussion focused on migration issues, providing assistance to partner countries, strengthening international cooperation, and better targeting of available resources. As illustrated by the Khartoum Declaration on AU-HOA Initiative on Human Trafficking and Smuggling of Migrants, ministers and other representatives of the participating African countries agreed to a range of measures including the implementation of provisions of other relevant regional and international schemes of cooperation. They agreed that refugees should be treated in accordance with these provisions and conventions and they should examine the root causes that make people vulnerable to human trafficking and smuggling as well as ways to manage the issue from its roots. This may entail raising public awareness to broadening policies and programs towards economic and social development, human rights, and improving the rule of law and education. In order to combat traffickers and smugglers there is a provision for training and technical support in the origin, transit and destination countries in order to develop and strengthen the capacity of law enforcement. Regarding the humanitarian assistance, states would provide specialized assistance and services for the physical, psychological and social recovery and rehabilitation of trafficked persons and abused smuggled migrants. 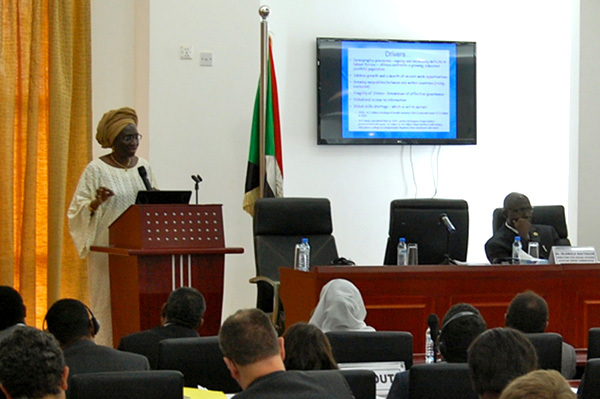 ILO’s Cynthia Samuel-Olonjuwon presenting on Labour Migration Governance for Development and Integration in Africa. © IOM/Craig Murphy 2014. All things considered, these measures and provisions cannot be implemented if there is a lack of cooperation, coordination, and support among all relevant stakeholders, including regional and international organizations, especially UNHCR, United Nations Office on Drugs and Crime (UNODC), International Labour Organization (ILO) and IOM as well as civil society organizations and the private sector. The Khartoum Process is crucial because it “provides a political forum for facilitating the more practical measures that must be accomplished at international, regional, and national levels.” The African Union aims to develop the African Union Border Programme (AUBP) in order to achieve these measures and goals. The AU is formulating policies that could build on the AU Convention on Cross-Border Cooperation, also known as the Niamey Convention. This Convention serves as the legal instrument of the AUBP. This programme addresses issues as border security, trade migration, infrastructure and communication on border matters, aiming at conflict prevention. The Declaration on the African Union Border Programme and its Implementation Modalities was adopted by the African Ministers in June 2007. The key factor in this challenge is to eradicate the problem from its roots. More specifically, international actors should continue supporting the transition and the establishment of rule of law in the countries where the migrants originated, supporting investment in development and poverty eradication, supporting resilience, and enhancing sustainable livelihoods and self-reliance opportunities. The Valletta Summit Action Plan serves as a significant example of these efforts. The implementation of the content of this Action Plan is monitored by the Rabat Process, the Khartoum Process, and of the Joint EU-Africa Strategy. Regarding the detection and combat of smuggling of migrants at sea, the missions responsible for disrupting the business model of smuggling and trafficking currently undertake concerted efforts to identify, capture, and dispose vessels as well as assets used or suspected of being used by migrant smugglers or traffickers. Operation Sophia, launched in June 2015 under the auspices of the EU, provides a notable example of these types of operations. Another important proposal aimed at the root causes of mixed migration is Article 13 of the Cotonou Agreement, in which many countries of origin of migrants are signatories, and its amendments to be applicable to the recent developments. Article 13 includes aspects of illegal migration and examining its impact with a view to establishing, where appropriate, the means for a preventative policy. Considering the close cooperation between the IMO and European Union, members of the IMO council should urge the EU to proceed with this application of the Article which concerns the promotion of dialogue regarding migration in the framework of the African, Caribbean, and Pacific Group of States (ACP) and EU partnership and provide useful guidelines on how it can be done in an effective way. 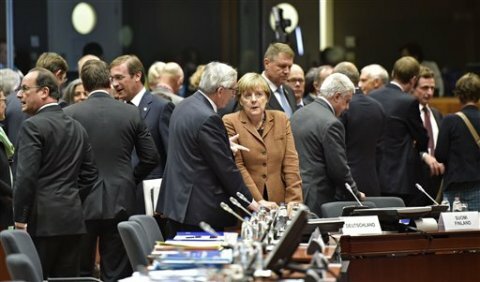 Moreover, based on the Berlin Plus Agreement and considering the success of Operation Atalanta, whose aim is to tackle piracy, it is undoubtedly crucial to secure increased cooperation between EU and NATO and the establishment of joint operations. As part of Operation Atalanta, both the EU and NATO performed similar duties in the same operational theater but without an agreed framework, unlike operations Althea and Concordia which were under the auspices of Berlin Plus Agreement. Land-locked States shall have the right of access to and from the sea for the purpose of exercising the rights provided for in this Convention including those relating to the freedom of the high seas and the common heritage of mankind. To this end, land-locked States shall enjoy freedom of transit through the territory of transit States by all means of transport. Considering this, no actor should stay uninvolved in this challenge. Close cooperation at the international and regional level in the medium term can prove that efficient management of the migration crisis in the Mediterranean is not a modern day illusion but a realistic possibility. Evmorfia-Chrysovalantou Seiti is a graduate of the Master’s Program “Political, Economic and International Relations in the Mediterranean,” Department of Mediterranean Studies, University of the Aegean, Rhodes, Greece. “Joint statement from IMO Secretary-General Koji Sekimizu and IOM Director-General William L. Swing on enhanced cooperation and collaboration between the two Organizations.” June 29, 2015, Statement available at: https://www.iom.int/sites/default/files/press_release/file/IMO-IOM-Joint-Statement-June-2015.pdf. United Nations Convention on the Law of the Sea of 10 December 1982, available at: http://www.un.org/depts/los/convention_agreements/texts/unclos/part10.htm.